For better business success, be a team, not a family. 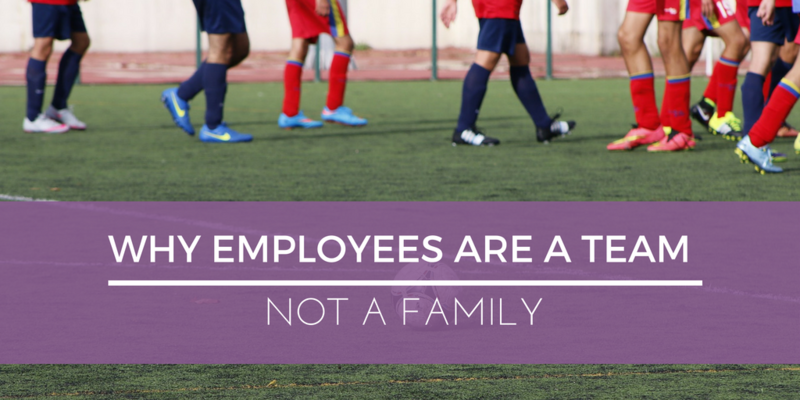 I cringe when organizations say employees are treated like family. I know it sounds harmless enough; the term “family” evokes a feeling of being valued, nurtured and cared for – all good things. So what’s wrong with a business being a family? Sports teams are all working towards one common goal – to win. Organizations are doing the same thing – all are trying to be successful – however each defines success. Families, however, are dynamic and diverse and each person defines success differently in a family. Families aren’t regularly working together to achieve a common accomplishment. Businesses and sports teams have an identity that is larger than the sum of their parts – their brand and culture. Teams have mascots, traditions and fan society; businesses have a brand and an identity, an employee experience and culture that will stay relatively established regardless of new individual changes. While families definitely have traditions, a family is always ever changing, from additions to divorces to deaths and any one change can be big enough to forever change the larger family culture or dynamic. Families are brought together mostly by chance – you don’t get to pick your siblings, parents, children. Organizations and teams can strategically select which players are brought on in order to fill a specific need – everyone brings something together to create something whole that will utilize each part. Netflix operations work to function as a high performance professional sports team “built to win”. Communication on a team is only about the team’s performance – when you win, you celebrate; talk about what worked, then reuse it. When a team loses, you re-evaluate then make changes and adjustments to avoid future losses. It’s very clear to figure out the “wins” and “losses” on a team and in business and dialogue amongst both a team and an organization is usually about performance. What do families communicate about? Lots of different things – but rarely about “family performance”. Once you’re in a family, you’re always a part of that family, and there is no threshold of performance expectation you have to meet in order to maintain your identity as a family member. If you’re not measuring up to expectations on a sports team – you get cut. It’s important to be able to weed out low performers in your organization in order to protect the morale and health of the larger team. I like what Linda Lausell Bryant, the executive director of Inwood House said to the NY Times, “if someone is taking the organization down, we can’t accept that because the organization is bigger than any one of us.” In family matters our hearts and emotions rule us rather than analyzing data and facts about whether or not we’re meeting success. Transparency is a huge indicator of employee engagement and motivation. It’s important for leaders of businesses to think about how to share as much relevant information as possible with employees. Transparency on a sports team? Success or failure is as obvious as it gets – everyone on the team knows where one another stands. In a family, how often are communications between parents and children transparent, for example? Families are hierarchies and information doesn’t need to always be shared and probably shouldn’t always be shared. But in a business – if you want happy employees, keep it clear. Teams rally around each other to support, encourage, challenge and motivate. Each team member wants the same thing – a win – so why wouldn’t every team member work to make sure every other member of the team is also able to do his or her best in order to achieve victory? Trying to accomplish a common goal with a diversity of individuals involved with each playing a specific part – can create a powerful environment of innovation and success. Calling employees family may not immediately have negative effects, but over time, that kind of familial culture will not lead to the same environment of an innovative team with a sense of camaraderie, teamwork, and communal achievement. What professional sports team does your organization perform like?